This pitcher pump is a great solution for pumping water from shallow wells, ponds, or as an emergency hand pump during a power outage. Also makes a wonderful decorative item for your yard or garden. The pitcher pump can pump water from a depth of 20-24 feet. It can also be used to pump from any water source less than 24 feet (barrel, boat deck, etc). 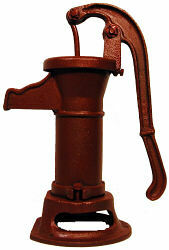 The pitcher pump is designed to sit on a flat surface (8 inch diameter). The bottom bolt down pattern on the pitcher pump consists of three 1/4 inch holes equally spaced 5 3/4 inches apart in a triangular shape. Pipe connection to bottom of pitcher pump is 1 1/4 inch threaded female connection. 1. Up to 24 feet of pipe with male 1-1/4 inch threads on one end. This pipe can be any straight pipe 1 inch to 1 1/4 inches in diameter. If you are using the water for human consumption use a potable (drinking water) grade pipe. 2. A foot valve on the bottom of the pipe to prevent backflow. The foot valve will also decrease the need to prime the pump along with preventing debris from entering the pump or pipe.